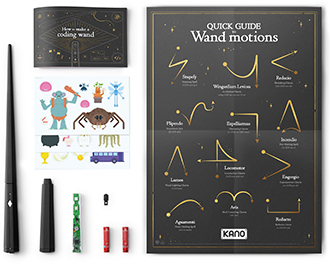 Follow the simple steps, and build a coding wand that responds to your movements. Learn how it works as you go. Wave your wand and see instant effects on screen. Make feathers fly, goblets multiply, fire flow, pumpkins grow, and more. Unlock challenges across iconic locations like Hogwarts, Diagon Alley, and Hogsmeade. The more you complete, the more costumes and medals you earn. Once you’ve learned the basics, there’s no limit to what you can do. Create your own coding wand art, games, and music. Share your code creativity with the Kano community. Be inspired, see the code behind what others have created, and tweak it to make it your own. Learn to code with step-by-step creative challenges. Make feathers fly, goblets multiply, toads transfigure, serpents slither, and more. Wave your wand and see instant effects on screen. 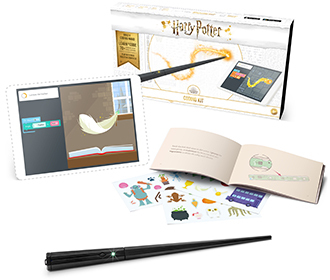 Create with creatures, sweets, spells, 200+ exclusive sounds, music, and wizarding artifacts. Watch how easy it is to create magic with your wand.